*Returns are the extra pole lengths required at both ends to rejoin the line of the wall. 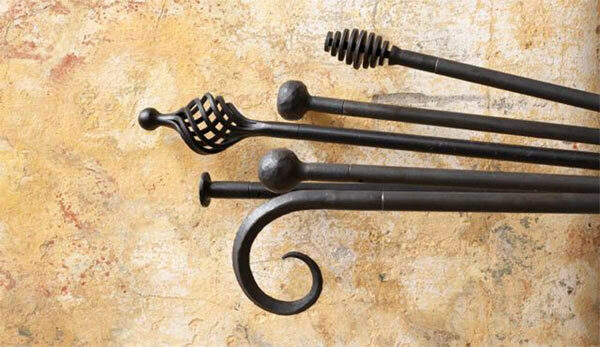 Each finial includes a short stem with a pin that slots into the curtain pole, finial lengths shown under finial type. 3 - How many brackets? Curtain Brackets sit the pole 6.5 cm from the wall. Passing brackets are strongly suggested. Call us if you are unsure. 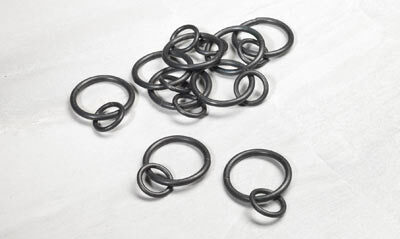 4 - How many curtain rings? We advise that you have 1 ring per 10cm (minimum) of curtain pole. Do ensure you have an even number of rings for each curtain. A passing ring has a gap in it to allow it to pass over the brackets. Please adjust the totals below to match your particular curtain arrangement. Curtain rings come in two designs. 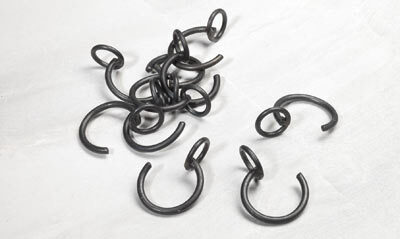 There is the straightforward wrought iron ring and what’s known as the passing ring which has a gap in it to allow that section of the curtain to pass through the brackets. Based on the overall length of the pole, the number of both types of rings you will need (1 for every 10cm) will be automatically calculated, we suggest half normal and half passing rings, but you may need to change this split depengin on the arrangement of your curtains. Most bays will need five brackets in total, two standard (end), two passing, and one centre bracket. If in doubt please phone and ask.